The Largest . . . Maybe the Oldest? Please note that this article was written in the fall of 2004. Since this article was published, a new state champion baldcyrpress was found in 2005. 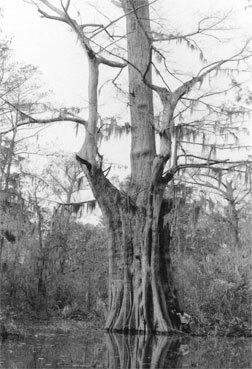 It is in Holmes County and stands 82 feet tall with a trunk circumference of 660 inches or 55 feet. My reach, from fingertip to fingertip, is 5 feet and 10 inches, or 70 inches, and I'm an average sized adult. That translates to about nine and one half me's reaching around the trunk. That's one big tree! The first chance we get, we'll try to get a photograph of that tree for you to see. In the meantime, if anybody has a photo, please send it in to us. California has its redwoods and sequoias that tower over all other trees in the world, but there’s one tree here in Mississippi that can’t be beat, at least when it comes to measuring up against others of its kind in the state. 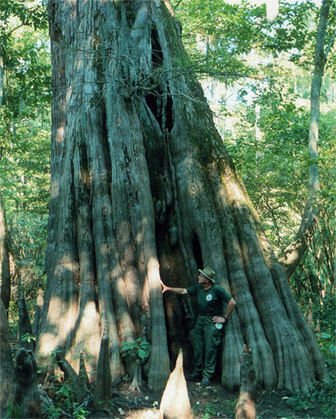 That tree is Mississippi’s largest baldcypress and it stands in the 773-acre parcel of land known as Sky Lake Wildlife Management Area, located eight miles north of Belzoni in Humphreys County. Sky Lake is a recent purchase by the Mississippi Department of Wildlife, Fisheries & Parks and is strategically situated in the Mississippi Flyway. 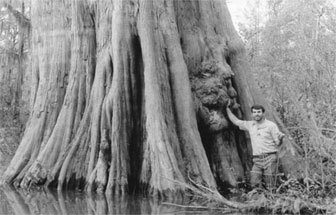 Jack Herring, retired from the Mississippi Department of Wildlife, Fisheries & Parks, stands at the base of our state champion baldcypress tree at Sky Lake (right). Although this tree is about 300 feet shorter than the world’s tallest tree (a California Coast Redwood or more commonly called Giant Sequoia), it’s 70 feet tall with a trunk diameter of about 15 feet and a circumference of almost 47 feet (eight me's). To put it into perspective, there are six houses worth of lumber there. The former state champion (left and in the close-up below), just 300 feet away from the new  state champion baldcypress, looms over County Forester Steve Burgess. Dr. Stahle finds Sky Lake to be “the most significant stand of ancient baldcypress in Mississippi” and praises the efforts that lead to the preservation of the area and its natural assets. Click here to link to the Mississippi Forestry Commission's Champion Tree page. Check this page for an explanation of the point system used to determine the largest tree status. This link will open a new page.